Most players don’t load up super difficult platformers such as Super Meat Boy for the deep and intriguing storylines that they provide. That’s pretty darned lucky for Coconut Island’s Shio since everything outside of the platforming itself is overly pretentious and utterly impenetrable. Now, I may not be very bright (shush, you) but having played through and past the end credits, I still don’t know what the vast majority of it meant. Was the lead character real? Was he a manifestation of his younger self? Was he actually his own daughter? What does his mask do? What was the purpose of the dumplings I picked up halfway through the tutorial level? Was Bruce Willis a ghost all along? If a tree falls in the woods and only a crow hears it, do I then gain the powers of the tree if I kill the crow? These questions and more are left completely unanswered by Shio. In all fairness, as I’ve already mentioned is to be expected, the story really isn’t the focus. 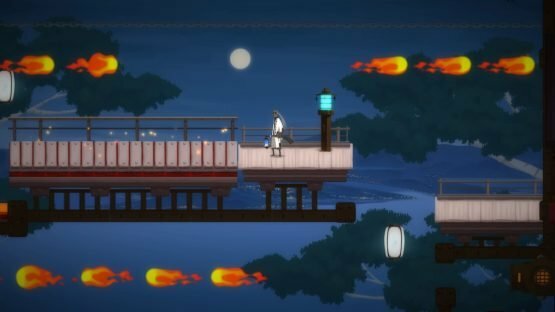 No, Shio is a super difficult side-scrolling platformer along the lines of Super Meat Boy and Volgarr the Viking, where the game requires you to make perfect runs from checkpoint to checkpoint while it tosses everything it has at you in an attempt to make you throw the controller out of the nearest window. It often succeeds, and if you’re lucky, your DualShock 4 might even hit that crow on the way out. You don’t get a trophy for that, by the way. What sets Shio aside from the rest of the platforming pack is the ability to multi-jump with a little help from lanterns dotted ever so precisely around the levels. From standing, you only have a single jump at your disposal. But you can chain jumps for as long as you like, providing you’re within touching distance of a lantern. 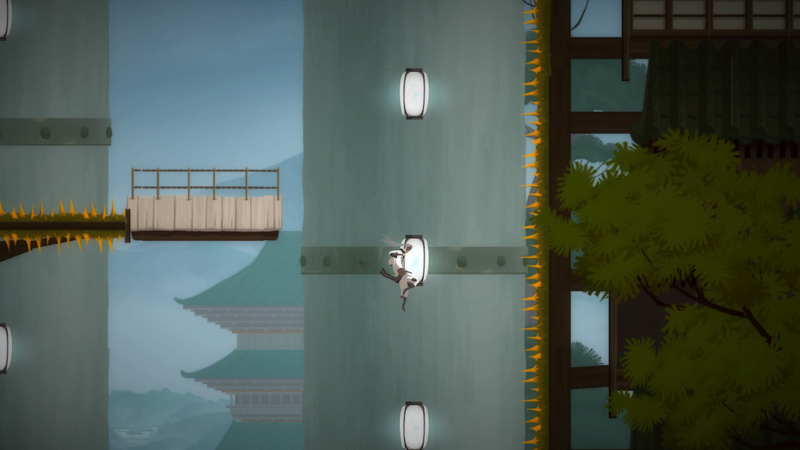 As you can imagine, this means that a large portion of the game sees you jumping from lantern to lantern to lantern with no safety net, only to miss your final jump and fall to your death. Or aim in the wrong direction and get hit by a fireball. Or catapult yourself into the teeth of a cog like an absolute moron. Don’t be upset by that, either, since after the hundred or so deaths that will have undoubtedly taken place within your first hour with Shio, “absolute moron” is probably the nicest thing you will have called yourself. The lengthy tutorial level that opens the game is surprisingly challenging, but it’s only an indication of what’s to come. Four stages are on offer, each comprising 30 or so checkpointed sections that range from mildly taxing to hair-pullingly frustrating. While the controls remain the same all the way through – move with the stick, jump with X – each of the overriding areas introduce more than one new mechanic to keep things interesting. One level suddenly has fire cannons taking potshots at you for example, while another will layer in blasts from a dust storm or platforms that break. You might suddenly come up against lanterns that move, or that switch themselves off and on periodically, so you need to time your jumps to the nanosecond to be able to use them. What’s generally in play though, is great design that will push a lot of players to their limit. Pixel-perfect precision is required in a lot of cases, and as the checkpoints get further and further away from each other, you’ll need to memorize what you need to do to get through each part of each section safely. Doing it is another thing entirely, of course. I say that the puzzle design is only generally great because it isn’t something I can say about every section. The good outweighs the bad for sure, but there are times when the somewhat floaty nature of the lead character’s leaps can lead to unwanted imprecision in a game that demands preciseness. Having to land on a pole that’s no wider than your feet is no simple task in the first place. Not knowing if you’ll have to overcorrect for an extra step you didn’t ask to take is frustrating, to say the least. Being asked to land on ten of these poles in succession could be enough to snap even the hardiest of players. The use of invisible platforms and obstacles can be a galling in some places, too. Lanterns that must be activated so that you can see what’s coming next are all well and good, but they often don’t reveal enough of what’s ahead to give you enough of an idea of the situation with which you have to deal. That means that in a couple of stages, you’re looking at dozens of blind attempts at reaching safety because you don’t know what’s ahead of you. Those parts are about as much fun as they sound. For those who find the standard game all too much, Shio does provide a slightly easier mode that is about as comforting as a slap in the face with a brick. Sure, the landing points are slightly wider in places, and the checkpoints are somewhat more frequent, but the challenge is still going to be beyond a large percentage of players. Players who love to pit themselves against the toughest of the tough will be salivating at this information though, as well they should. In all honesty, it’s hard to sum Shio up without another “generally.” The story sections where you control a little girl as she takes tiny slow footsteps across the screen until absolutely nothing happens do nothing but annoy. Then the trial-and-error sections of gameplay that actively force you to suffer unnecessary deaths are frustrating enough to put a downer on things. But, even with all the flaws considered, when Shio gets things wrong – which it does pretty much everywhere outside of the platforming itself– it generally makes up for the errors with challenging action. If only that last “generally” weren’t needed, it would be right up there with the best of them. Shio review code provided by the publisher. Version 1.00 reviewed on a PlayStation 4 Pro. For more information on scoring, please read our Review Policy.